Super flexibility in the scheduling, as an event can be set to operate everyday, by using this timer switch outlet to power-cycle your household appliances, it's easy to take control for the best energy efficiency. Switch in setting time, this helps to give an impression that the house is occupied during your absence when you are on business or on vacation. Manually run the summary procedure, non WIFI function, avoid the mobile phone is not compatible, no electricity, no signal, and so on. 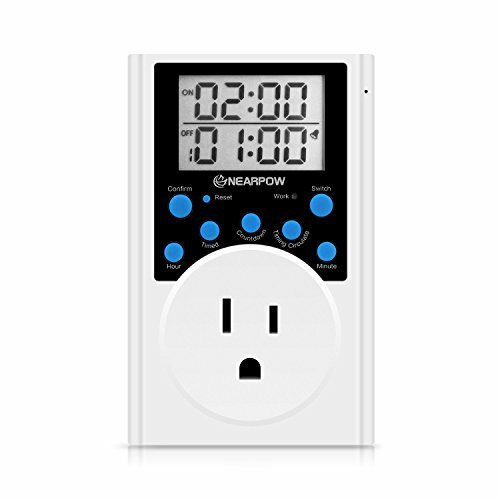 You are able to turn on/off the outlet timer before the pre-programmed on/off time arrives, giving you much more convenience. Can set a group or set up three groups at the same time working alone time, daily cycle. Time switch TV, router, air purifier, humidifier, water dispensers, no lights when the home guard against theft, etc. Can be arbitrarily set on/off after a certain length, avoid some electric no timing function, or the timing function ength too short or too long. Mobile phone charging, or as the kitchen cooking for timer, can choose whether to have alarm to remind. Mode of Hour Min and Mode of Min Sec, the minimum interval of 1 second, infinite loop. Available for The Christmas tree lights. Intermittent switch according to the time to work, that is, in the intermittent cycle control mode. Available for sprinkler irrigation, temperature control. Intermittent switch long work on time, that is, work in continuous or an infinite loop. Available for scientific research laboratory.